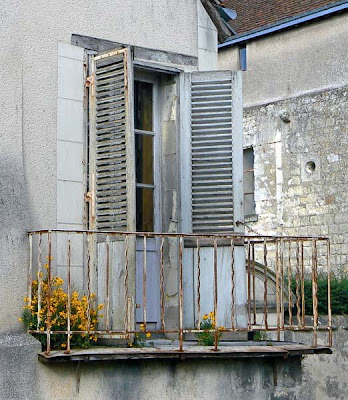 This balcony on a house in Saint-Aignan has seen better days. But the flowers are blooming and it has a kind of shabby charm. There is obviously somebody living here since the shutters are open. Most places that are empty are shut up tight. At first I thought the flowers were just growing out of cracks, but they are actually in little pots. Thank the dog. Just after eight pm on Friday night, she let me know she wanted to go outside. So we went out back. The sky was clear, the sun had set just a short time before, and the stars were shining. I'm pretty sure this view is of the Straight of Gibraltar, with Morocco on the left and Spain on the right, making it very close to the location of the station when I first spotted it. I noticed a very bright light moving slowly from the southwest toward the northeast. At first I thought it was a plane, but the light was very bright and steady. No blinking. I followed it around the house to the front. Callie saw it immediately and barked at it the whole time it was visible. She's never barked at airplanes before. I've seen satellites go by overhead over the years, but this was different. It was big and incredibly bright; brighter than any satellite I've seen. A plane with a light that bright would have been low enough in the sky that I would have heard its engines, but this was silent. So I thought, could it be the space station? I came upstairs and logged on to my favorite sky-watching web site, Heavens Above*, and sure enough, the space station was visible where I live for about eight minutes at the very moment we were outside, and its path was the one I observed. To me, this is very cool. 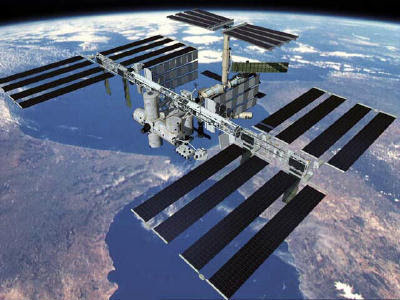 Just by chance to see the International Space Station fly by. If I were truly a nerd, I would have known it was going to be visible and been ready with binoculars, even though I know it's just the sun glinting off the huge array of solar panels that I'd see and nothing more. Maybe next time. 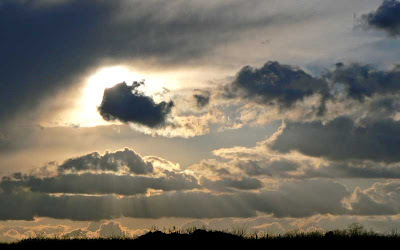 *Heavens Above is a very cool site for seeing what's going on in the sky. In addition to tracking satellites and other orbiting objects, they provide star charts and the positions of the planets and comets for any time, any place on Earth. Here's another opportunity to put my nerdy side to use. Since I quit working, I've had to channel my need to build spreadsheets to good, rather than evil, purposes. I have spreadsheets that calculate all kinds of things about our country life, from utility usage to weather patterns to who's coming to visit. We've been keeping rain data for just over three years now with a handy little rain gauge in the back yard. We record the data after every rainfall in a little form that I then transfer to my spreadsheet. Then I make all kinds of charts and graphs. Hey - I used to get paid for this kind of stuff. Today's chart illustrates that, as we suspected, the years are getting increasingly wetter since we've been here. I only have data for three years and we've lived in this house for nearly five, but still, a pattern is evident. The monthly rainfall data is grouped into years that run from April to the following March. Kind of like a fiscal year. There was an 11% increase in rainfall from the 05-06 year to the 06-07 year, and a 6% increase in rainfall from 06-07 to 07-08. We're still under the historical average annual rainfall amount of 650 mm (the average is actually for Blois*, but it's the closest city that I could find data for). For the feet & inches people, 650 mm is about 25 and a half inches. When we moved here in the summer of 2003, the year of the great heat wave, it was very dry. The French weather channel often reports that the country has been dealing with drought conditions and a lowering water table for a while now. A look at our rain data vs. the historical average certainly supports that. Maybe we're beginning to come out of the drought. It's hard to imagine it being any wetter than it is right now. 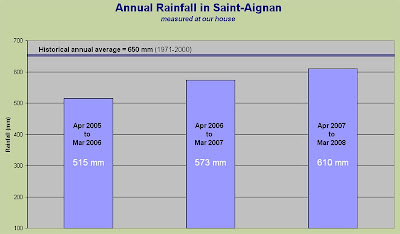 * I found weather data at another website that showed the average annual rainfall for Blois at 753mm, but there is no information about what years that average is based on, and since I already had my chart done, I decided to go with what I have. 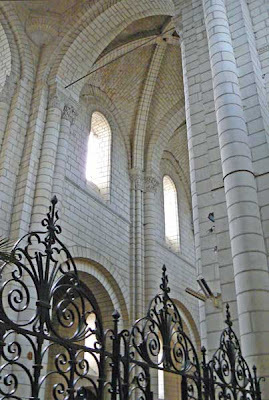 Here are a few snapshots of the church, or collégiale, in Saint-Aignan. I ducked in the other day when I was wandering around town waiting for my passport photos to be printed. 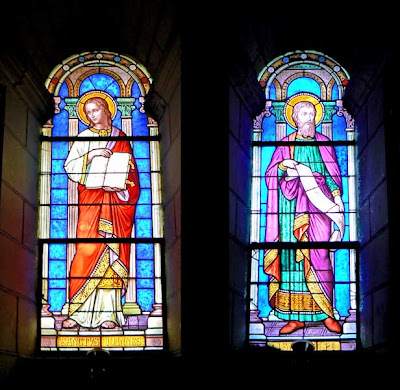 The above is a composite photo; these two windows are not next to each other. 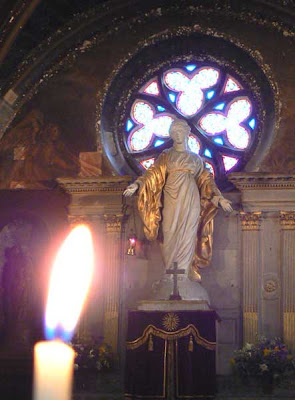 Most of the church's windows are simple plain glass. I don't know if they were originally that way or if they were once stained glass that has since been broken (during the war?) and replaced. The church is not spectacular, but is a decent example of the eleventh and twelfth century romanesque building that it is. It was built over the foundations of a much older church, parts of which survive as the crypt in the current building. The church is quite active, serving for local weddings and funerals in addition to holiday masses throughout the year. 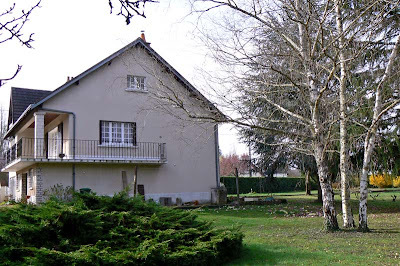 There is no longer a local priest, or curé, in residence in St.-Aignan from what I've read. As is our tradition, Ken and I ate rabbit on Easter Sunday. This year, like I mentioned, we tried out a Thai stir-fry that we saw on TV. The recipe is for rabbit, but I'll bet it would be great with chicken or good lean pork, too. Some of the pieces of rabbit. We had a whole rabbit. Ken cut it up into bite-sized morsels and put the carcass and head into a pot to make broth (for another dish later). Instead of a whole rabbit, you could use four legs as long as all four are hind legs; there's not much meat on the front legs. 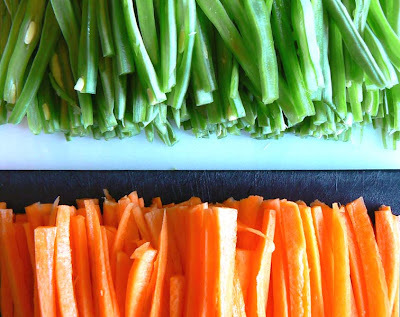 Julienned flat green beans and carrots. Of course, you can adjust the spices to your own liking. I added a fresh chopped cayenne pepper for heat. 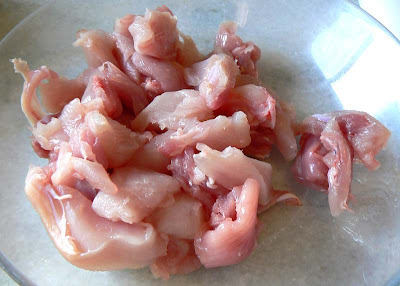 After marinating, drain the rabbit pieces and reserve the marinade. Onions, marinated rabbit, beans, and carrots in the wok. In a hot pan or wok, sauté one onion that has been cut into slices. 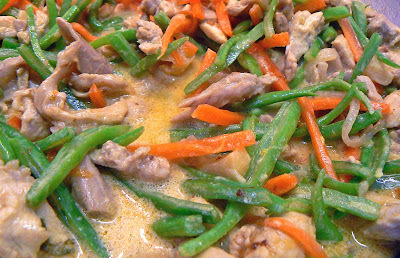 Add the rabbit and stir-fry until golden brown. 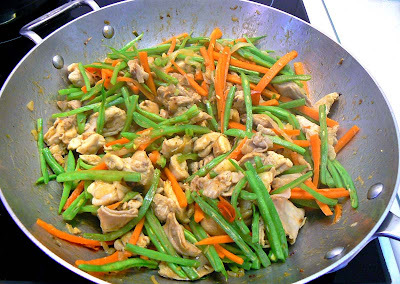 Add one or two carrots and about 200 g of flat green beans, both julienned, and stir-fry until they begin to get tender. The marinade goes in to make a sauce. Add the marinade to the pan and simmer until it's cooked and the sauce has reduced slightly. Serve sprinkled with fresh cilantro. We made rice noodles to have on the side. Served with noodles and fresh cilantro. It was delicious. We followed it with a dessert of sweet Thai sticky rice with mango and toasted sesame seeds. 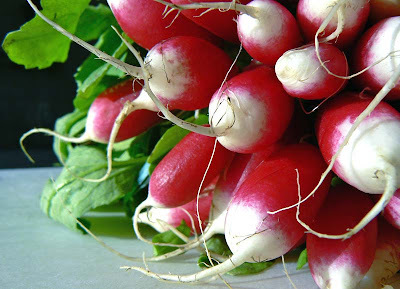 These fresh radishes are among my favorite things to start a meal with. Crisp and slightly tart, dipped in good salt and accompanied with a fresh baguette and a bit of sweet butter, they make a terrific and healthy first course. I got these at the market in Montrichard on Friday. We ate them on Saturday, just before a plate of beef and carrot stew with french fries. Yum! On Friday morning I drove over to Montrichard. We're making our traditional rabbit dinner for Easter (yes, we eat the Easter Bunny), but this year we're having rabbit with a twist. 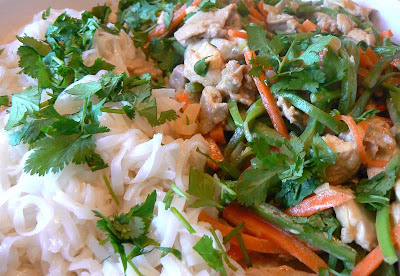 Ken found a Thai rabbit stir-fry recipe that sounds real good, and we're going to try it. So I needed cilantro, and during the winter when I can't grow it in the garden, we have to buy it. The problem is that cilantro is not a very high demand item in the stores around here and is consequently hard to find. But the Super U in Montrichard had some a couple weeks ago, so I went back to get some more. After my quick trip in and out of the supermarket, I stopped in downtown Montrichard to go to the bank and walk around the weekly farmers' market there. I had great parking karma. There were three poultry vendors in the market selling rabbits. Most people who sell poultry at French markets also sell rabbits. One vendor, whose base of operations is in the town next to ours (and who also sells at the St.-Aignan market on Saturday mornings), had rabbits for €7.90 a kilo. Another vendor was selling them for €8.90/kilo, and a third had nice rabbits but didn't have a price on display. I got in line for the €7.90 rabbit - the one I got weighs about 1.5 kilos. It's whole, with the head and the giblets. Most people were buying duck and chickens, but there was one woman in line ahead of me who bought a rabbit. Some other people after her bought rabbit "wings." Since rabbits don't usually have wings, I was curious when I heard the woman ask for some. Turns out they're the front legs of the rabbit and they look kind of like chicken wings. They bought a whole mess of 'em. Next, I went over to a produce stand and got some flat green beans and a bunch of radishes. The beans are for Sunday's rabbit stir-fry and the radishes are for today's entrée (with butter and bread). There must have been four or five different vendors selling oysters, too. Since it's Easter weekend, I think that people are getting oysters for their holiday dinners. They looked really good, but we didn't need any this weekend. The market was lively and fun, and I saw many of the same vendors that we normally see on Saturdays in St.-Aignan, like the mushroom lady and the woman who sells goat cheese from her farm up behind our house. It had been raining, and everything was wet, and the vendors' lights reflected in the pavement and made the whole scene very pretty. People were smiling and joking, and all the vendors were laughing and having a good time. Since I got everything we need for the weekend on Friday, we don't have to go out to the market this morning. 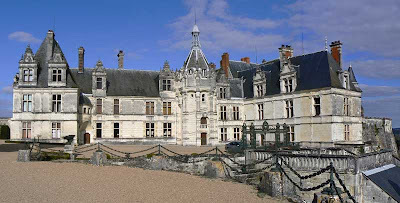 The southern, or courtyard, façade of the Château de St.-Aignan. 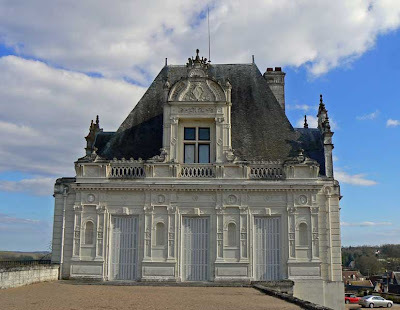 Our local château sits up on a bluff above the Cher River in Saint-Aignan. It's quite an imposing sight from down below. It's a privately owned, lived-in castle, but the public is allowed to enter the courtyard to see the building and the views from up there. There are no tours of the interior as yet, and the park grounds are closed to the public. The western façade of the renaissance château. 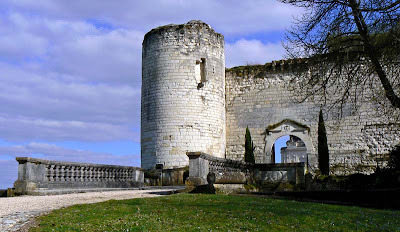 The renaissance château was built in the 16th century over the ruins of the medieval castle that once stood there. Some of the old castle walls and towers are still visible today. Ramparts and a medieval tower. 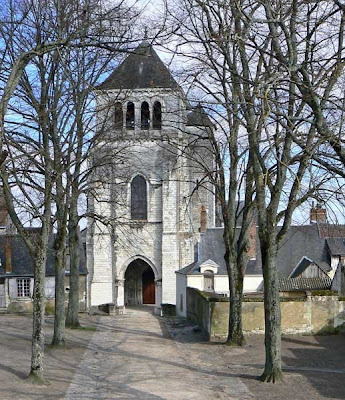 St.-Aignan's castle and church are the two predominant landmarks in our neighborhood. I took these pictures on Tuesday, when I was in town waiting for my passport photos to be printed. A surviving medieval tower and wall on the western end of the courtyard. Whenever we have visiting friends we drag them up to our local castle to wander around and check out the views. It's not Chambord or Chenonceau, but we like it just the same. Pedestrians descend a grand stair from the courtyard and end up facing the town's church. The embassy called on Monday to tell me that my passport photos were rejected. The print quality wasn't good enough (I printed them at home). 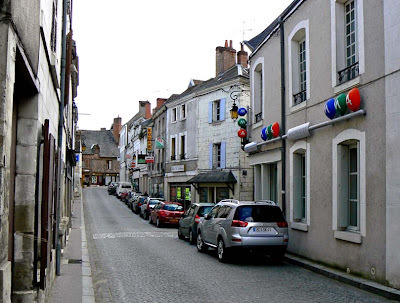 The street in St.-Aignan where the photographer's shop is. I went into town to ask a professional photographer to print the photo from my digital file. I had carefully sized the photo to the American passport specifications - which, by the way, are different from the European standard, making it very hard to find passport renewal photos outside of the large cities - so that all the photographer had to do was print the file. Which she did, but she said that the images were just too blurry and no good. Indeed they were. She offered to take the picture for me, but I had to explain that the Americans demanded pictures of a different size from standard European ID photos. Her boss got in the discussion at this point. "But we conform to all the European regulations for ID photos," he said. "No hats, no glasses, no smiles." "Yes, but I'm getting an American passport, and they have different rules, except for the hats and the smiles part." The photographer then suggested that I get my picture in the US. I had to explain that I live in France, and that I'm renewing my passport, and that flying to New York for two little passport photos would be just a tad expensive. We all had a good laugh over that. The closest photographer that's set up to do American passport photos in our region is on the other side of Tours, about an hour away from here. We discussed exactly how I was taking my photo, what camera, which tripod, how many megapixels and dpi, etc. They suggested I go home and try it again, which I did. After much messing around with photos and photoshop, Ken and I discovered something. When I reduced the photo to the proper size in photoshop, the reduction process resulted in an image that was slightly more blurry than the original. If I left the image large, but told the printer to print it at the small size, the image was crisp and clear. And this was only apparent when the two photos were printed side-by-side (and when I put my reading glasses on). So I made up a new file with the larger image, made sure everything was proportional so that it would reduce to the proper size on the photographer's printer, and took the new file back into town. She printed it and, voilà! A perfectly crisp image at the correct size. Do you want to know what the photographer charged me for a 4x6 print with two images on it and all the time and advice they gave me? Forty-five cents (eurocents). I'm sending the new photos up to Paris today. Here's a photo of the house. It's not a view that people normally see. It's taken from the north side of the property, looking south. Our street runs on the opposite, or south, side of the house, just behind the hedge you can see in the right side of the picture. And here's more evidence of the approaching spring. 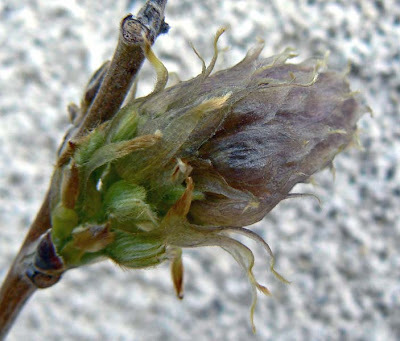 Above is a wisteria bud. I planted the vine in 2006 and this will be it's second full year. There are plenty of flower buds, but what I really want to see are some tendrils that will take it up the side of the house. I'll let you know how it does later in the season. 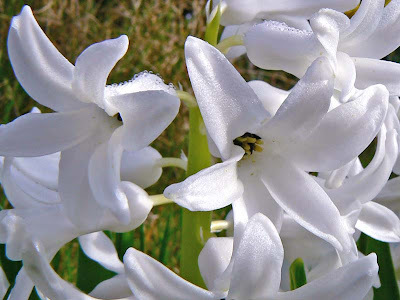 This is a standard hyacinth, jacinthe in French. There are about six of them that I moved from one part of the yard to another and they seem to be doing fine where they are now. 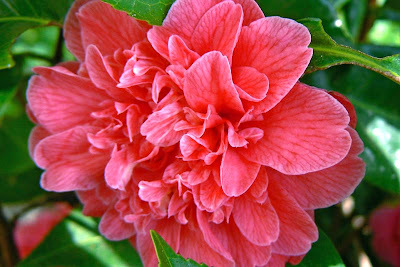 We also have two camelias (above) on either side of the garage door. I don't think they're in the right place since they don't get much sun. I cut them down to the ground, hoping to kill them, one year. They've come back of course and they look ok. But they don't flower as nicely as the one we had in San Francisco. Still, they provide a little greenery next to the garage doors, so what the heck. 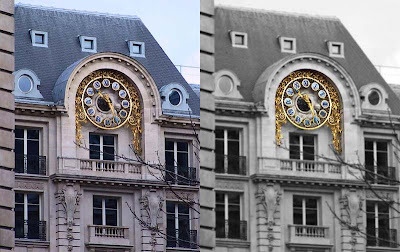 CHM recently asked to see the original of the picture of the Parisian clock. A side-by-side comparison, as it were. 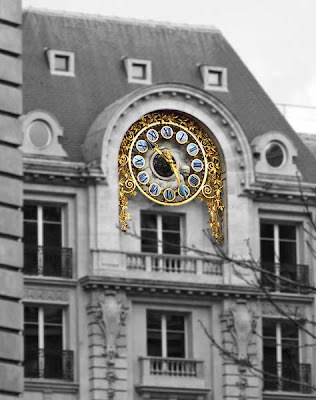 I used photoshop to change the color and focus of the picture so I could highlight the clock. On the left is the original picture, and on the right is the photo after I messed with it in photoshop. Which do you like better? ps to claude : I don't really remember where this building is. Looking back at the order in which I took pictures that day, it may be somewhere along the blvd. des Italiens, or on a close-by street. 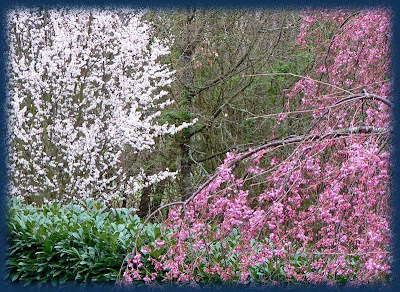 Spring is almost here, and this week we've seen a lot of change in the back yard. Our daffodils are in full flower, and buds and leaves are pushing out, getting ready to open. I miss the leaves. 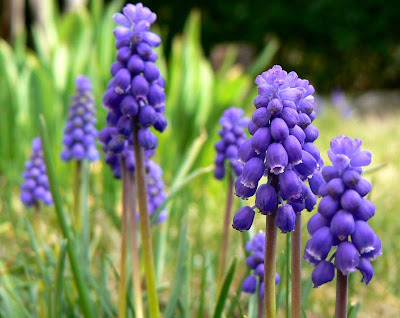 Muscari, or grape hyacinth, that I successfully divided and relocated. The daffodils in the photo on top are starting to fill in nicely. I relocated most of these from other parts of the yard over the past couple of years. At first they looked kind of sad and lonely, but now they're getting there. 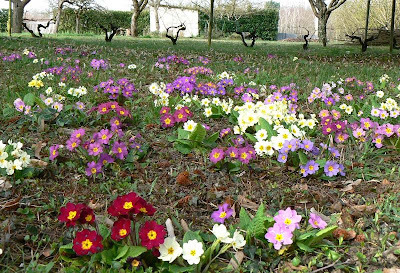 We have a carpet of primroses on the north side of the house. We did the same the same with some irises (relocated them) in 2006. Actually, our friend Sue did most of the work while she was here visiting. They, too, are looking better than they did last year, although I think they'll be even better next year. It's still too early for flowers, though. This is year two for our lilac bush. I once read this about planting bulbs & irises: the first year they sleep, the second year they creep, and the third year they leap! If that's true, then next year should be great. Since a few of you asked for that fish recipe I made the other day, here it is! 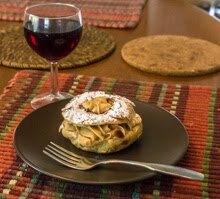 I got the recipe from Cuisine TV. Eric Léautey did a show this winter about fish, and this was one of the recipes he did. It's made with merlan, a white fish found off the European coast in the Atlantic. I don't know if it's available in the US, or even what it would be called, but I suspect you could use any firm white-fleshed fish for this dish and it would be great. Finely chop the shallots. 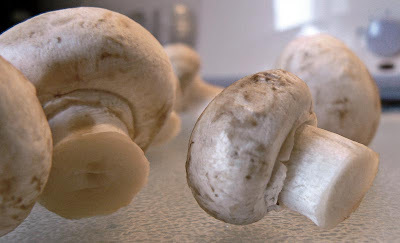 Chop the mushrooms into a duxelle (use the food processor if you have one). Lightly sauté the shallots and mushroom duxelle together in a little oil or butter. Season with salt and pepper. Don't fully cook them. Spread half the shallot/mushroom mixture on the bottom of a baking dish. Put the fish fillets on top and season them with salt and pepper. Spread the remaining shallot/mushroom mixture on top of the fillets. Dissolve the mustard in the white wine (use a whisk if necessary). Gently pour the sauce over and around the fish. Dot with bits of butter. Bake in a pre-heated 190ºC (375ºF) oven for 20 to 30 minutes. For an extra touch, remove the fillets after baking and mix the the sauce with a stick blender together with a tablespoon or so of crème fraiche. Sprinkle with chopped parsley and serve with fresh lemon slices if you like. The recipe called for 4 fillets, but I think you'd need more mushrooms & shallots for that. Adjust accordingly. 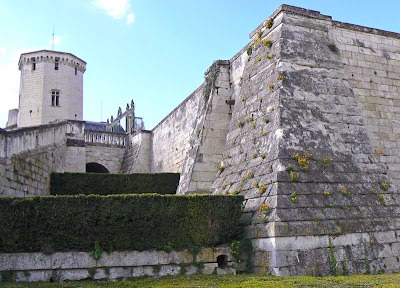 The Chaumont castle sits perched above the Loire River about a half-hour away from where we live. It's a great place to check out, even if it's just for a walk in the park, when we have visitors. I took this photo two years ago this month. It looks almost like a fairy-tale castle to me. 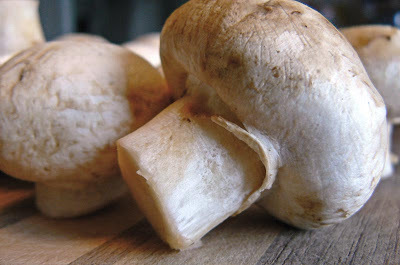 Champignons de Paris, or button mushrooms. These tasty morsels will be "duxelled," combined with shallots, and used as a base for a baked fish dish. *** Update: the baked fish (merlan) with mushrooms and shallots and white wine and mustard was dee-licious. Time is moving kind of slowly right now. We're between seasons, tired of winter and anxiously anticipating spring. The weather is not cold, but it's not warm either. And today a windy front is moving through. 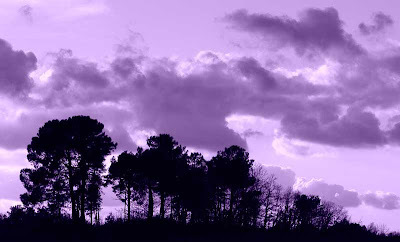 Somewhere in Paris (March 2006). Both of us are itching to get outdoors and work in the yard, but it's too wet to really do much of anything that hasn't already been done. The dog wants to be outside more, too, but she tracks in a lot of mud and that's a real pain. So we do what little we can outside (yesterday I gathered sticks and twigs for kindling) and spend the days indoors cooking, watching movies, and surfing the internet. Sunday was the first round of voting in the French municipal elections, so we watched a little election coverage in the evening. 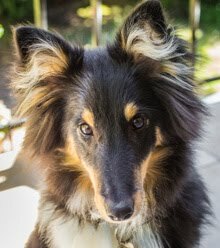 This week we need to go to the vet's office for some more Frontline, to the pharmacy for prescription refills, and I have a dentist appointment. I also need to get my passport renewal application in the mail to the embassy. How about a little scene from Provence on a sunny Saturday morning? 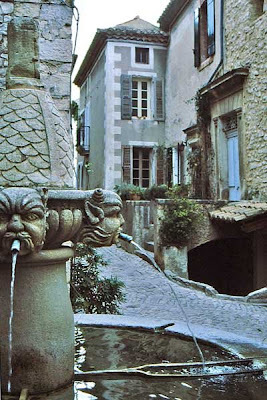 The village is Séguret in the Vaucluse. 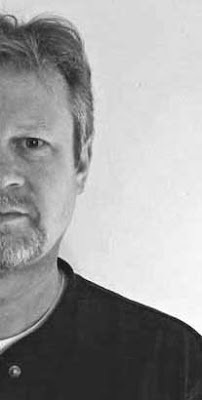 Not a great photo, but I wanted to get my face off the top of the blog. Don't want to scare the little children. I took some photos for my passport renewal on Thursday. Then I started playing with them. 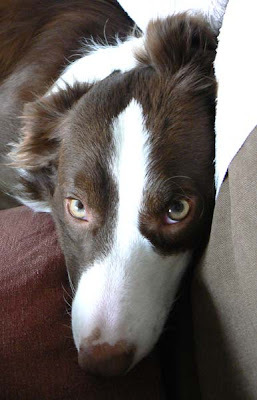 There was a blog I looked at by a guy in Australia - he did symmetrical photos of his face. He's in dental school and he posed for the class face analysis. Apparently the class was talking about how faces are anything but symmetrical. So he decided to see what his face would look like if both halves were the same. He posted some some of the photos of himself. They were pretty interesting. I'm sparing you all of that. Be grateful. Just a couple more shots of the stormy afternoon sky this past week. Maybe Jimi Hendrix saw things like this? The actual color of the sky. I took a bunch of sepia photos on Tuesday when some snow squalls were going through. I posted a few this morning, but I didn't like the way they looked on the blue background. They were very brown. I've since traded them out for these. 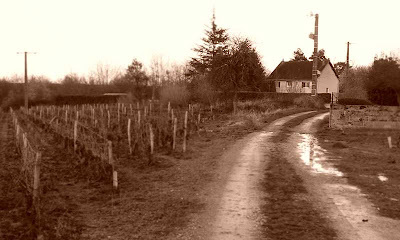 Our house seen from the vineyard. 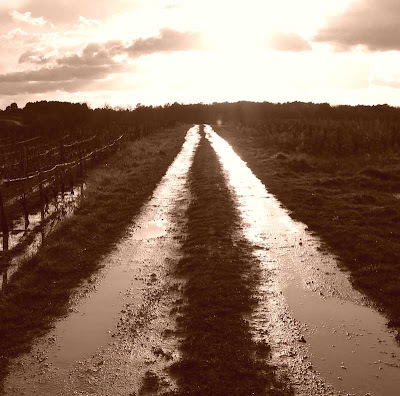 The dirt road becomes a mud road when it rains. 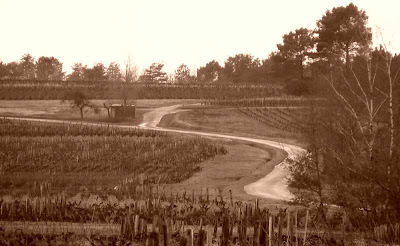 The paved "route touristique" winds through neighboring vineyards. I think these work better because they have more bright sky in them to counter the brown. What do you think? I may re-post the others as black & white photos. We'll see. That's how it feels this time of year. The forecast for the next few days includes freezing temperatures in the mornings. Now that there are flowers on the trees and daffodils blooming, the gelées matinales are less welcome than they were a month ago. 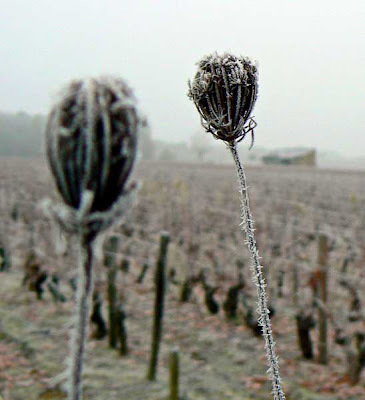 Morning frost on dead stalks of wild carrot (Queen Anne's lace) in the vineyard. 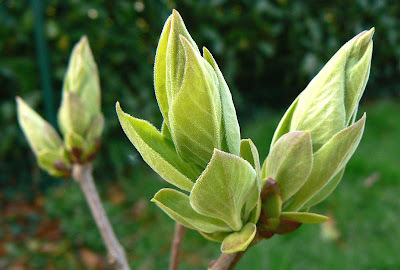 I should go outside today and renew some mulching around certain plants so the frost won't kill off the new growth. I also need to get the ax out and split some more kindling for the wood stove. The fires sure are nice in the evening. For the cold mornings, we use the furnace. We haven't had nightly fires for a week or so, but yesterday afternoon the wind kicked up and it felt cold, so I put one in. I expect we'll be burning again for the next few nights. It's a little work, hauling kindling and logs into the house, and cleaning out the stove and disposing of the ashes each day. But a little work is good and it's much more economical than burning fuel oil. I'm very glad that I got all the logs cut last fall. It's been great not to have to haul out the chainsaw in the cold and damp of winter. Some remnants of last summer can still be seen out around the vineyard. The oak trees have kept their brown leaves; new growth in the coming weeks will push them off. Patches of tall grass and wildflowers look like so much straw, criss-crossed with deer paths. 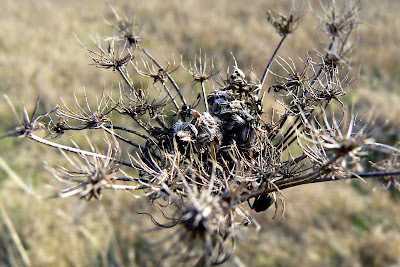 This dried up queen anne's lace is one of hundreds that survived the winter winds and rains. It won't be long before it's gone and new growth takes its place. Happy First of March! The flowering trees around us are starting to do their thing. The pink one is in our yard, the white one is next door. That green hedge on the bottom is about seven feet tall and separates our yard from the neighbor's. I had great plans to go out and take pictures of other flowering trees in the 'hood on Friday, but the wind kicked up and it's wet out there. So I just stayed inside.